A Greater Date: Pet Lovers, Animal Lovers & more! For some people, the term 'pets' is a misnomer, because the little animals that live in their house are really just part of the family. And for these people, you don't really own a pet...you share your life with a little friend. So, if you know that the person you will end up with has got to be an animal lover, then of course it makes sense to consider online dating and social networking sites that focus on pet owners. While there are (now) a large number of sites with just such a focus, many sites now specialize in specific types of pets (or little friends)...dog owner sites, cat owners sites, etc. Regardless of the type of animal you 'share your life with', we have listed the sites we've found to make it easier for you to browse/search for your 'pet lover' soulmate. 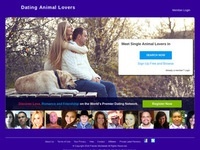 Pets Passions is a free dating site for singles with pets. Since your pet is part of the family, finding a match who feels the same about pets is important. Join for free and take advantage of free email, chat, forums and more. Ok, if your pet is family, then you know how important it is that your prospective romantic partner get along with your little furry friend (or not furry as the case may be). Basically, if you are looking for pet loving singles, then Dating Pet Lovers was custom made for you. Join for free and see if you can find your perfect pet loving partner! If you are looking for other singles who care about animals, then Dating Animal Lovers is the site for you. As part of one of the largest online dating networks, you can easily find others who care about their pets and animals in general. Join for free and check out all the animal lovers online right now. 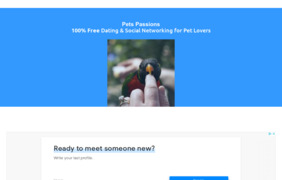 "DateMyPet.com brings pet lovers together. Singles with a love for their pets, looking for friendship or love." Dog people naturally seek out other dog people, for obvious reasons...they are better people. If you are seeking someone who 'gets' that dogs are just great, then Dog Lovers Online Dating is for you. Join for free and set up your profile among all the other dog lovers on the site. Who knows, maybe you'll meet someone special, and their dog will love your dog as much as you end up loving...oh, you get the idea. Large online community site for dog lovers. Enjoy photo galleries, dog groups, forums and blogs. As part of a large online dating network, Cat Lovers Dating provides a way for cat lovers to meet one another online. If you are looking for someone who loves cats as much as you do (or you just want to make sure your significant other isn't allergic), this might be the site for you. Click through to check it out, and set up your own profile for free. "Share cat photos, tell cat stories, make cat friends!" Catster is more about the celebration of cats by cat lovers than it is an online dating site...but maybe you'll meet a special catlover of your own. "Meet other cat lovers who really match your PURRsonality!"